For the world's financial system to start functioning normally again, it is imperative that confidence in the credit markets be restored. 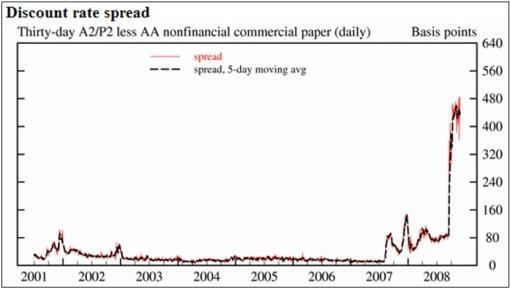 In order to gauge the progress being made to unclog credit markets, I regularly monitor a range of financial sector spreads and other measures. By perusing these one can ascertain to what extent the various central bank liquidity facilities and capital injections are having the desired effect. 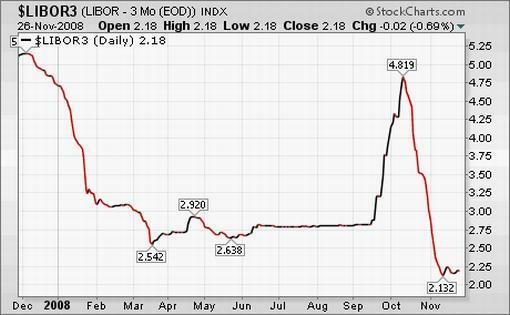 First up is the three-month dollar LIBOR rate. After having peaked on October 10 at 4.82%, the rate declined sharply to 2.13% on November 12, but the healing process has since experienced a setback with the rate edging up to 2.18%. LIBOR trades at 118 basis points above the Fed's target rate of 1.0%, compared with 43 basis points at the start of the year. 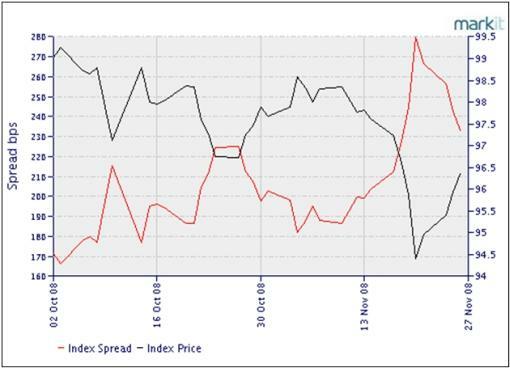 Since the TED spread's peak of 4.65% on October 10, the measure eased to 1.75%, but has since worsened to 2.10%. 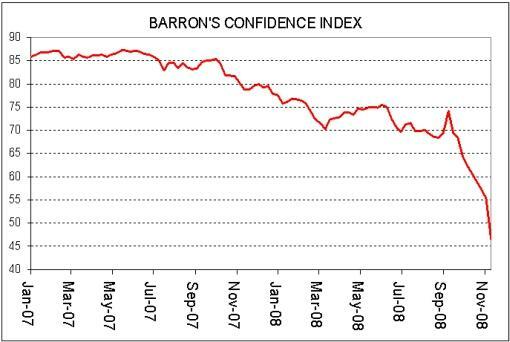 Another indicator worth keeping an eye on is the Barron's Confidence Index. This Index is calculated by dividing the average yield on high-grade bonds by the average yield on intermediate-grade bonds. 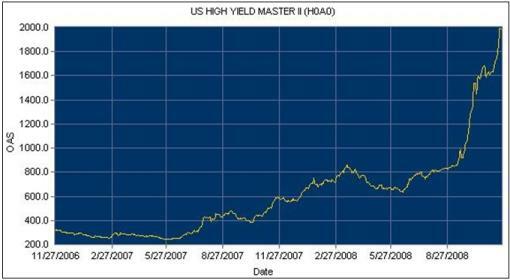 The discrepancy between the yields is indicative of investor confidence. A declining ratio indicates that investors are demanding a higher premium in yield for increased risk, showing waning confidence in the economy. Lastly, some CDS statistics as at November 26, courtesy of Markit . These prices represent the cost per year to insure $10,000 of debt for five years. For example, Italy is in most trouble among the G7 countries with a cost of $139 per year to insure $10,000 of debt. 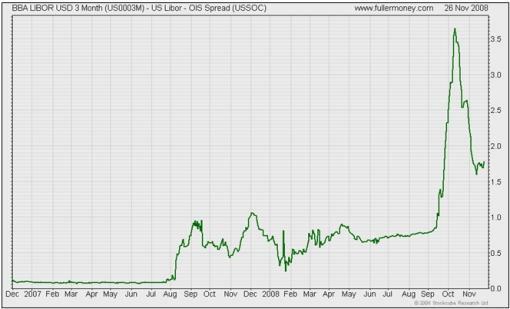 The TED and the LIBOR-OIS spreads have eased (i.e. 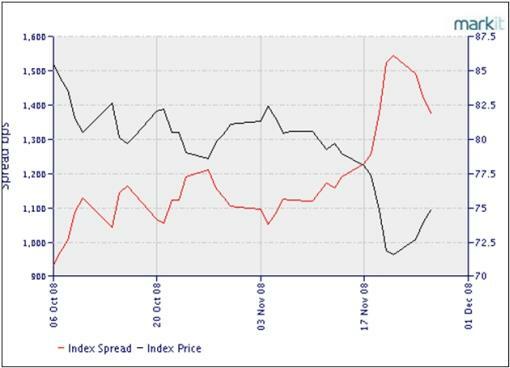 narrowed) since the panic levels of October 10, whereas the CDX and iTraxx indices have also shown some improvement over the past few days. 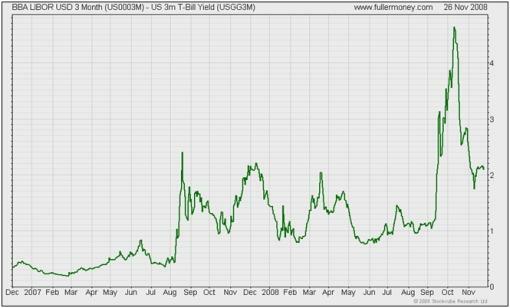 However, US Treasury Bills and high-yield spreads are still at distressed levels. In summary, although some progress has been made as a result of central banks' liquidity facilities and capital injections, the credit markets are not yet thawing.